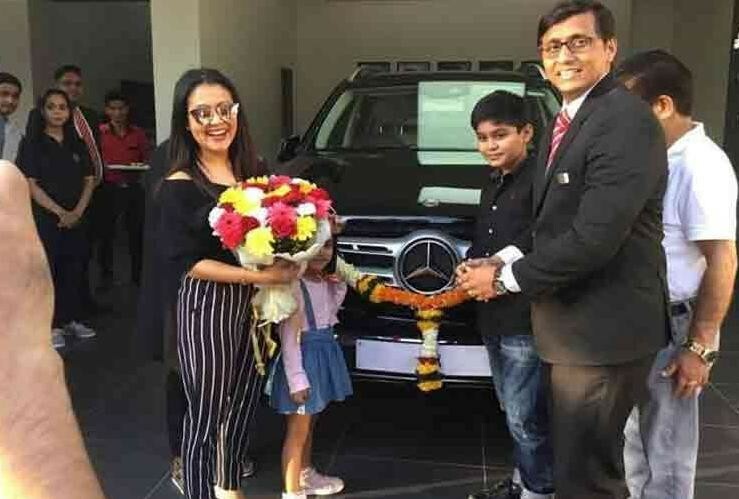 Singer Neha Kakar recently bought his brand new car Mercedes-Benz GLS 350. Well, this is not a big deal for these stars, but this car is so expensive that knowing your worth your senses will fly. singer Neha Kakar shared a picture on social media showing off her latest possession – a brand new Mercedes-Benz GLS 350. Neha took delivery of the car recently and we’re glad that she chose the company’s flagship SUV to get around. which people are talking about many types of things. Well, the price of his new car Mercedes-Benz GLS 350 is 95.72 lakhs.The company launched the GLS 350 back in May 2016 and it comes priced at over ₹ 80 lakh. Cosmetically, the 2017 Mercedes GLS falls in-line with the S-Class and gets a revised front including the contoured headlamps with Multi-Beam lamps along with LED daytime running lights and a massive two-slat grille finished in silver. The bumper has been tweaked to get larger air-intakes and gets a large chrome diffuser. Since the price has been known, people are talking about them. People say that at this price any person can buy a decent 2 houses in the posh area of ​​the city. Neha has posted many photos with her new car, due to which she has become the subject of discussion among the people. Mercedes-Benz India is offering security and electronic aids at 2017 GLS, which includes collision prevention assistance, crosswind assistance, meditation assistance, pre-safe, break assist, cruise control, ESP and electronic AWD traction system, which has 4 ATS . Let us tell you that Neha has been in the limelight for her personal life over the past few years. She is currently dating actor Himant Kohli who is 1 year younger than her. Many photos of both of them were viral on social media on Valentine Week. Bigg Boss 11 Most Shocking Revealed : An Undiscovered Video Of Shilpa Has Surfaced.